PRESIDENT BUSH AND LAURA BUSH ARRIVE THE SOUTH PORTICO ENTRANCE OF THE WHITE HOUSE. GARY WALTERS IS PRESENT. THE BUSHES WALK INTO THE STATE DINING ROOM FOR PRESIDENT BUSH'S SURPRISE BIRTHDAY PARTY. THEY GREET GUESTS INCLUDING: ROLAND AND LOIS BETTS, SEC. DON EVANS, JOE O'NEILL, MARVIN AND MARGARET BUSH AND THEIR CHILDREN: MARSHALL AND WALKER; HARRIET MIERS, ANDY CARD, ANDI BALL, CONDOLEEZZA RICE, AL GONZALES AND OTHERS. THE PRESIDENT POSES WITH WHITE HOUSE PASTRY CHEF ROLAND MESNIER IN THE PRIVATE RESIDENCE. THE PRESIDENT'S BIRTHDAY CAKE FEATURES A BASEBALL BAT. PRESIDENT BUSH AND VP CHENEY WAVE TO THE CROWD IN THE RAIN ON THE SOUTH LAWN. THE PRESIDENT HOLDS UP BARNEY FOR THE CROWD TO SEE. PRESIDENT AND MRS. BUSH STAND TOGETHER ON THE BALCONY AND LOOK AT THE VIEW (SHOT FROM BEHIND THEM). THE PRESIDENT EATS DINNER IN THE SOLARIUM AND JOKES WITH AL GONZALES. INCLUDES FIREWORKS PHOTOS (JUMBO P4969-13). 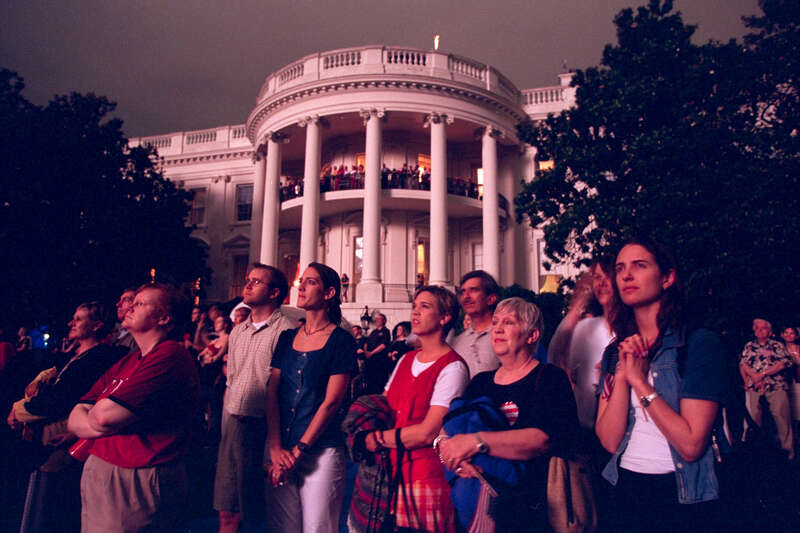 SHOWS THE CROWD ON THE SOUTH LAWN WATCHING THE FIREWORKS (JUMBO P4963-3). BIRTHDAY PARTY PICTURES ARE RESTRICTED.